In a letter to Secretary of Interior Ken Salazar, Senator Dianne Feinstein expressed dismay with the slow Federal Government permitting process for solar projects proposed for private land. In the letter, the Senator points out that renewable energy projects in California proposed for BLM (public) land benefit from a speedy permitting process, while projects proposed for private land languish because specific government agencies do not share the same commitment to a speedy process as much as BLM, Fish and Wildlife Service and the California Energy Commission (CEC). This bureaucratic slow down could dissuade more energy companies from developing on private land, which is likely to be of less significant biological value and have less impact on the Mojave Desert. Particularly because energy companies are hurrying to complete certification before the end of the year so they can qualify for Department of Energy sponsored loans. A picture taken from the Granite Hills in the Mojave National Preserve this past weekend. I plan to take a closer look at the Ridgecrest EIS and also update you on other solar projects in later posts this week. Stay tuned. In the California Energy Commission's (CEC) Staff Assessment and Draft Environmental Impact Statement for the Ridgecrest Solar Power Project, the CEC recommended against the project, citing the potential damage to biological resources could not be mitigated. Solar Millenium proposed building a 250MW dry-cooled solar energy plant on a 3,995 acre right-of-way just west of Ridgecrest -- approximately 2,000 acres would be disturbed for the site construction and operation. Overall, the CEC Staff's recommendation is a very positive sign that the certification process can account for the need to preserve wilderness and biological treasures in the Mojave Desert. Despite the Staff's assessment, the final decision will not be made until after the CEC holds evidentiary hearings and the presiding member makes a final decision. The staff assessment is not a final verdict. I've been on the road so consequently I have not been able to post recently. I plan to share the fruits of my travels and post some photos and experiences from a recent visit to the Mojave National Preserve. In the meantime, I wanted to point out that the Ridgecrest solar power project Staff Assessment and Draft Environmental Impact Statement is available on the CEC website. As noted in previous posts, the Ridgecrest project could have impacts on Mojave Desert biological resources comparable to the Ivanpah Solar Electric Generating System. I'll post a summary of the assessment and EIS this week. California Governor Arnold Schwarzenegger signed legislation (SB 34) this week that intends to speed up the certification process for solar energy proposals under consideration by the California Energy Commission (CEC). The law allows the State to collect developer fees (at least $75,000 for each application) from companies applying for solar energy permits that would fund a dedicated staff to conduct the environmental impact review. The law also creates the Renewable Energy Development Fee Trust, which would create a centralized process for collecting mitigation funds assessed by the CEC for specific proposals. The State and Federal agencies would then use these funds for mitigation efforts to off-set the environmental impacts. It is not yet clear how this mechanism fits in with the efforts of the "Renewable Energy Action Team," (subject of a previous post) which also sought to streamline the mitigation cost collection and distribution. 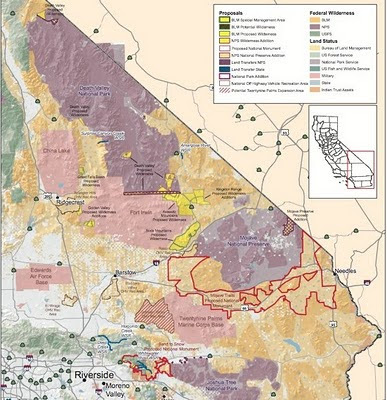 Can the California Desert Protection Act of 2010 be Passed this Year? Following the announcement of Senator Feinstein's proposed California Desert Protection Act of 2010 (CDPA 2010) in December, civic organizations across California have been seeking support from local city councils and members of Congress in order to pave the way for its introduction into Senate and then House debate. Senator Feinstein indicated that she would like to see the bill (S.2921) at the Senate for a vote before the end of this year. So how does it look for CDPA 2010? Even though several town councils, off-road organizations, and conservation groups have joined to support the intent of the legislation--which would set aside 1.6 million acres for conservation and provide permanent off-road vehicle recreation areas--the legislation's passage may be threatened by political realities in Washington that ignore the local grassroots and civic support building behind the legislation in California. The Victorville City Council once again considered whether or not to support or oppose Senator Feinstein's proposed California Desert Protection Act of 2010 (CDPA 2010). Once again--for the third time--the Council decided to delay taking a vote on the matter, citing the need for more information. Several citizens present at the meeting voiced support for the legislation, and one citizen from Victorville opposed the legislation. Although ultimately whether or not a city council opposes or supports the bill will not directly impact the legislation, the measure of local support for the legislation will be used to indirectly bolster or erode the legislation's chances when it comes to a vote for committee debate in Washington. For that reason, if you support the legislation you should contact your local officials and let them know. For the City of Victorville, you can obtain the councilmember's email addresses on their website. Today the California Energy Commission (CEC) posted another update on its consideration of BrightSource Energy's Ivanpah Solar Electric Generating System (ISEGS). The CEC Staff assessed that even though the proposed solar site presents significant negative impacts to visual resources, and significant cumulative impacts to land use, and traffic, the staff deemed that the need to develop renewable energy to combat global warming was an "overriding consideration". Note that the CEC Staff no longer considers the site to pose any significant impact to biological resources. Per my previous post, the CEC deemed proposed mitigation conditions and BrightSource Energy's altered footprint to sufficiently off-set the likely loss of special status plants and animals. According to an addendum to the California Energy Commission's (CEC) Draft Environmental Impact Statement for BrightSource Energy's proposed solar site in Ivanpah, CEC staff declared that the altered site proposal to avoid special status plants (see previous post) fully compensates for damage to biological resources. The staff previously concluded that the Ivanpah proposal did not fully account for the harm it would cause to an array of desert wildlife, to include the rare Rusby's Desert Mallow, Mojave milkweed, desert tortoises, and potentially bighorn sheep. The addendum does concede, however, that "on-site" mitigation for special status plants -- which would involve leaving some plants located on the site intact and keeping solar structures away from them--would likely fail and result in the loss of many of the protected plants. The California Energy Commission (CEC) released the Staff Assessment and Draft Environmental Impact Statement (SA/DEIS) this week for the Abengoa Solar Project. Overall the assessment lines up with what was a relatively good site location by Abengoa Solar--disturbed agricultural land. The mitigation plan calls for roughly 120 acres of land to be purchased and set aside for conservation, which is far less than the thousands of acres required to mitigate the Ivanpah Solar Electric Generating System in the eastern Mojave Desert. 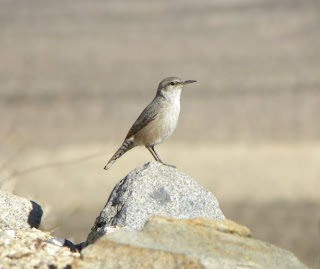 Biological surveys of the site only spotted one desert tortoise, but they did identify several species of special status birds, such as the western burrowing owl and LeConte's thrasher. Renewable Energy Action Team: Good Intentions but How Soon? The recently published Staff Assessment and Draft Environmental Impact Statement for the Blythe Solar project provides some insight to the Renewable Energy Action Team (REAT), which is the inter-agency task force addressing expedited renewable energy permitting process and environmental mitigation. The REAT consists of the Bureau of Land Management (BLM), Fish and Wildlife Service (FWS), California Department of Fish and Game (DFG), and the California Energy Commission (CEC). If this inter-agency team can implement its policy tools quickly enough, it could have a positive effect on efforts to mitigate damage done by industrial-scale energy development in the desert, but the current proposed schedule for REAT calls this into question. I just finished watching the USGS-sponsored desert tortoise documentary titled "The Heat is On: Desert Tortoises and Survival," which I highlighted in my last post. It's definitely worth downloading or viewing online if you want to learn more about the science behind the recovery efforts, and the array of threats that the tortoises face. You can check it out at the USGS website. The US Geological Survey just released a documentary on the Desert Tortoise and the Federal Government's efforts to study its status and factors affecting its survival in the Mojave Desert. The documentary--titled "The Heat is On: Desert Tortoise and Survival"-- notes the importance of the Desert Tortoise to the entire Mojave ecosystem. Although the website is a bit slow (I wish they would post it on youtube!) you can also download the movie file separately or read the transcript at this site here or here. On the second link in the previous sentence there is an option on the right side of the page to download the full movie or transcript. 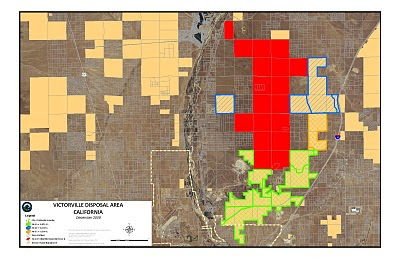 Defenders of Widlife, which is an intervenor in the proposed Calico Solar project east of Barstow, requested that Calico Solar LLC conduct another review of its proposed site for special status plants this year. Defenders of Wildlife noted that the 2007 review of biological resources did not identify any rare plants but precipitation that year was also well below normal. Precipitation in 2008 rose to 88% of normal, and a review of the site in that year did identify special status plants. Defenders of Widlife highlights an important and time sensitive opportunity to conduct more accurate surveys of proposed solar sites this year since the Mojave Desert received approximately 200% of its normal precipitation this year. Any Ornithologists in the House? I'm an avid wildlife enthusiast, but I have much to learn, so please feel free to share your insight! A murder is about to happen. Fifteen metres away from us, beside a bullet-ridden oil can, a coyote sniffs the air. My daughters stop the Indian Runner jog they have recently developed across the acres of unfenced Mojave desert, and watch. The victim-to-be, a clueless jackrabbit, sits between us and the coyote, among a family of quail, who are scrabbling for insects under a scrubby creosote bush. "Stay still," I murmur, grappling in my pocket. I pull out my Swiss Army knife, and open it up. I know that coyotes rarely attack but best to be prepared. "That's the corkscrew bit, Mum," my seven-year-old, Ruby, says. "It's the only one I can do with my nails," I whisper. Solar Millenium's proposed Ridgecrest Solar Project considered alternative sites near Boron and California City that may have less overall impact on the Mojave Desert's biological resources since they are closer to industrialized or built-up areas, but determined that the acreage was insufficient or that it could not amass enough acreage due to the company's own arbitrary preference in land acquisition and unspecified guidance from the California Energy Commission (CEC) guidelines. 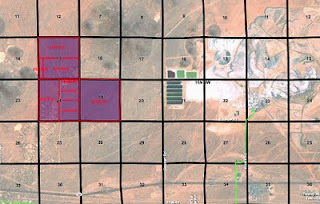 Data submitted by Solar Millenium indicates that the company's alternative site consideration seems shallow and suggests the company is not serious about smart site location. Sadly, for reasons previously mentioned on this blog, the CEC seems content to move forward with consideration of the company's proposed site, even though it is home to special status wildlife, instead of devoting more serious investigation to the alternative sites. Kelso Dunes practically materialized out of thin air, but only because wind currents and mountain formations formed a perfect match and dumped find sand adrift in the atmosphere onto the creosote shrub land now awash in sand dunes. If we continue to constrict the Mojave Desert with subdivisions and industrial development, these phenomenon could cease to exist. The Bureau of Land Management’s (BLM) California Desert District is soliciting nominations for five Southern Californians to serve on its District Advisory Council for the 2010-2012 three-year term, which would begin immediately upon confirmation by the Secretary of Interior. The five positions to be filled include one representative each for renewable resources, environmental protection, elected official, and two representatives for public-at-large. Anyone can nominate qualified persons in any of these categories. Nominations must be submitted by close of business Friday, April 21, 2010, to the California Desert District Manager, Bureau of Land Management, California Desert District Office, 22835 Calle San Juan De Los Lagos, Moreno Valley, CA 92553.